Twenty years behind bars in some of the most violent prisons in America would leave anyone with a lot of unforgettable memories, but artist Gil Batle's story really makes an impression. While serving time for fraud and forgery at institutions with serious reputations (including San Quentin and Chickawalla), Batle honed his art skills through tattooing. This week at Ricco Maresca Gallery in New York City, the self-taught artist, who now lives on a small island in the Philippines, will open a solo exhibition of works that illustrate his prison experiences not on skin, but on a surface far more delicate. 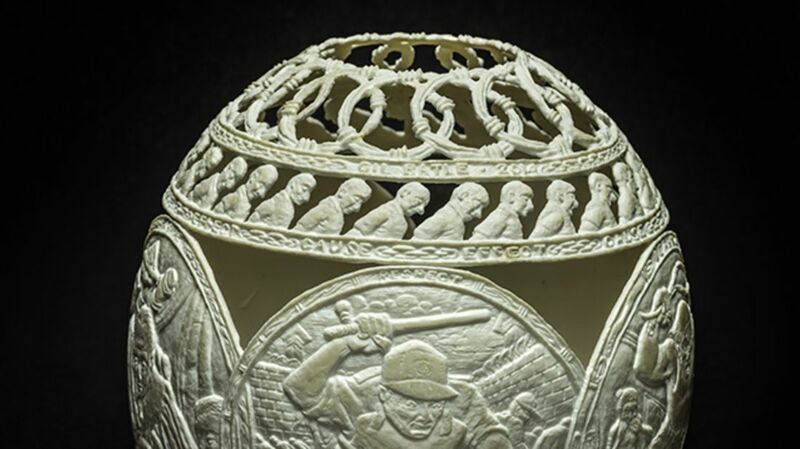 Titled "Hatched in Prison," Batle's exhibition features intricately carved ostrich eggs with portraits, symbols, and scenes from the lockups where he spent a large portion of his life. Author and curator Norman Brosterman writes in the gallery's press release that the 53-year-old artist's carvings tell the stories of "the violent men he knew, the sad mistakes that sometimes led to the incarceration of regular guys, the terrifying events he witnessed, and the bonds formed under the worst conditions." "Hatched in Prison" will run from November 5 through January 9. Check out some of Batle's incredible carvings below, and head to the Ricco Maresca Gallery website for more information.